The second part of Erikson's saga as impressive in its scope as "Gardens of the Moon". The novel follows the events presented in the book 1. 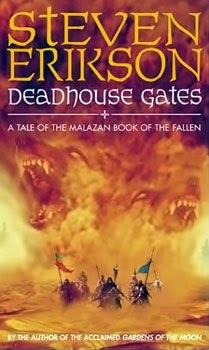 This time round, however, Erikson focuses on fewer characters, which makes "Deadhouse Gates" a bit easier to follow. The novel starts with the cull of Malazan nobility. The Empress wants to remove all possible threats. She goes to great lengths to achieve her goal, without preferential treatment for her own family. Laseen sends her younger sister Felisin to Otataral mines. There she will have to do everything within her power to survive. Her motivation to exact vengeance on her sister is so great that she is willing to do everything to live and be able to confront her. She makes two unlikely acquaintances - Heboric Light Touch, an ex-priest of Fener, and Baudin, who is basically a remorseless thug. At the same time we follow Icarium - an ancient half-Jhag warrior and inventor, and his friend Mappo. Their unlikely friendship will be tested as they are caught in a battle between Soletaken (shapeshifters who take form of large beasts) and D'ivers (shapeshifters who take form of numerous creatures, such as a swarm of insects or a pack of rats). Their quest leads them to the House of Azath, where the creatures fight for power and a chance to reach godhood over their race. Following their fates was really interesting as the relationship between the two is very complicated. Mappo is tasked with helping Icarium but also with controlling him and making sure the powerful warrior doesn't remember his past. Icarium's dark story is contrasted with the person of Iskaral Pust - a High Priest of Shadow, at first a host, and later a companion of the duo. He seems to be the new Kruppe of this novel, with his chaotic ramblings and erratic behavior. The novel deals with heavy subjects and by introducing a slightly more comical element, Erikson brings in a much needed element of relief. On another continent, Coltaine, a Wickan warchief who became a High Fist, is escorting Malazan refugees to safety. His long journey and grueling fight against pursuing forces is one of the most memorable fragments of the novel. His "army" becomes known as Chain of Dogs as they continue to struggle against overwhelming odds. Erikson's descriptions of this force and their battles are brutally honest. There isn't much glory in them, everything is done in cold calculation and there are no easy decisions. It's hard not to mention Duiker here. Erikson uses the Imperial Historian to provide accurate narration in the fragments of the novel that deal with military. Many characters that were introduced in the first book (Dujek Onearm, Tattersail, Whiskeyjack, Paran, Anomander Rake - just a few off the top of my head) are not present in Deadhouse Gates. I expect that they will be the protagonists of book 3. The main theme of the novel seems to be determination. It is connected with the will to live, survive and to reach a journey's end. The protagonists face odds that put them in a very tight spot but they do not question them and have no second thoughts. Once again, Erikson mixes the worlds of mortals and gods as they continue to play each others in their games. These interactions were present in the first book and I thought they were some of the most original elements introduced by the author. I was happy to find out that he continued describing them. The descriptions of the holy desert Raraku were also very impressive. It is shown as place where fates of mortals and gods intertwine and great events that will shape the fate of the world take place. The books gives answers to many questions raised in "Gardens of the Moon". At the same time it poses many others as we observe the main characters develop. "Deadhouse Gates" also show how complex the universe created by Erikson is. Events that seemed defining in the first book now look much less significant in the grand scale of things. Erikson's language is very rich and he has great skill in creating a character's personality with the way they speak and the jargon they use. It allows him to introduce many secondary characters that don't feel out of place but actually bring something to the story. There is also a lot of pragmatism in his writing but he still manages to surprise the reader with a few unexpected twists at the end of the novel.